Every now and again we get asked to do something a little out of the ordinary. Indoor axe throwing is something we’ve done many times in the past. It’s great when the weather isn’t playing ball. 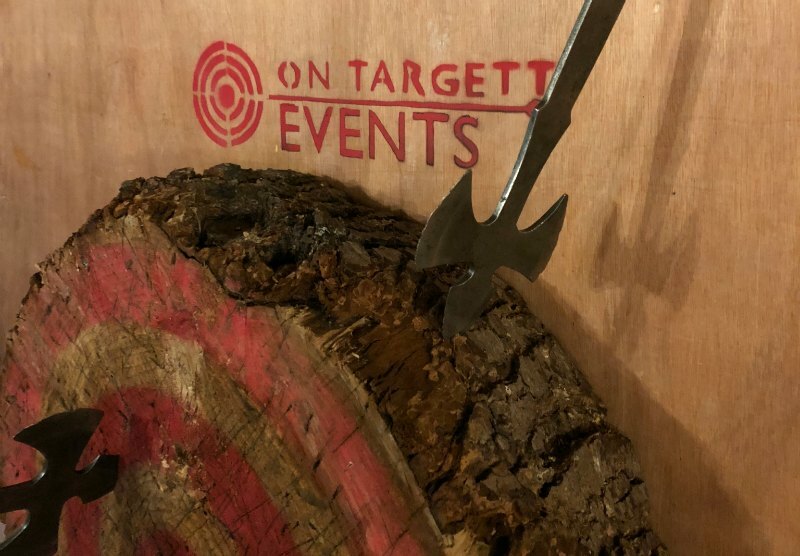 But axe throwing bars, or setting up an axe throwing team building event in a bar or pub, was a new angle on one of our most popular team building activities. 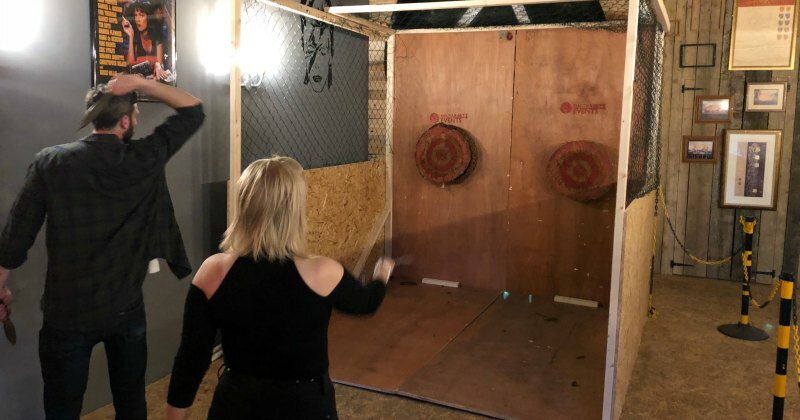 Turns out that axe throwing in bars is a rapidly growing trend across the pond (seems to have started in Toronto in 2011). It’s popularity means axe-throwing bars are cropping up all over North America. Now they’re on the way over here. After a site visit to both venues we were confident we could deliver small axe throwing experiences safely. One of the venues – The Atic, Banbury – had a small outside space which we decided would be the best spot for safe axe throwing. But The Atic at Bicester was a little more challenging. We’re always up for a challenge so Jack put his carpentry skills to good use and set about building a special enclosure for the bar. We do love a bit of creative thinking. You rock up at a bar and thinking you’ll have a go at some darts. Or maybe shoot some pool. Wouldn’t it be a lot more fun to be faced with this instead? But as it’s a little out of the ordinary, we made sure that all participants were fully briefed by our qualified professionals before they got anywhere near an axe, being shown how to throw our angels, knives and tomahawks. The one hour sessions meant that everyone had time to perfect their technique with expert instruction, without losing too much time at the bar! Like all of our team building activities, we take the time to ensure participants learn some skills too. Both evening events were a success and we’ll be making them a regular feature of the entertainment calendar. Get in touch if this sounds like something you would like to arrange for your next team building event. PreviousPrevious post:Has the snow gone yet?NextNext post:All quiet? No, not really!